6-4　Can you mark down the value of the package or mark it as a gift? You can order from our website using the special order form. If you have any questions regarding our products, send us a message using the “Contact Us” webform. 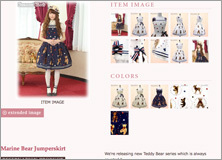 If an item has Reserve corner posted on the page, that means it is now up for reservation. Every product page has a table listing the item number, item name, color number code, sizes and price. Once you have found an item you would like to purchase, please copy the above information and paste it into the text box on the special order form, making sure you have the correct color code number. ※There is a chance the item(s) you request may be sold out. 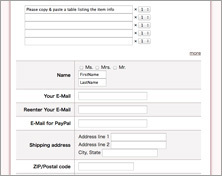 If you are ordering multiple items, proceed in the same copy-paste method of filling out the form. You can add rows until the count reaches 20 - please contact us if you need to go over that amount. Please fill out the fields on the special order form. After you have entered the items you wish to order, select the quantity for each item from the drop down box on the right side. Please enter your name and your title (Ms., Mrs., Mr.). 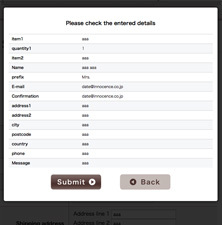 If you have a different email address for correspondence and Paypal, please enter both in the appropriate fields. If both addresses are the same, you may leave the "E-Mail for PayPal" field blank. Please enter your address and phone number. If you have any specific instructions, questions, or comments, make sure to tell us in the Message field. After confirming there are no mistakes click “Submit”. An automatic reply mail will be sent to your email address. At this point the availability of the merchandise in your order is not confirmed sso please wait for the order confirmation email. ＊ Rate includes service charge. We do not accept cancellations once your order partially nor tottally after it is complete so please make your orders with due care. Please remember that we may not cancel your reservations soon after you send one even before sending you an invoice. If you become a problematic customer by canceling or refusing to pay, please know that you cannot be allowed to order from our online shop in the future. Due to the fact that we have many stores and shared stock, we do not have a set amount of each item in our inventory. Because of this, there are times when an item may be mistakenly shown as available online but is actually sold out. So please wait for your Paypal invoice to make sure the item is available. After we receive payment, we collect all of the items from our stock and then send out the order. If reserved items are included in the order, we wait until all of the items are available before we ship. Orders will be shipped within 2 weeks of receiving payment. We use EMS (Express Mail Service) to ship orders. When we do not have a requested item in the online sales stockroom, we request it to be sent to our office from our retail stores unless we could find it. In such cases it may take a few days to a week to reach our office so we may not be able to send it out immediately. If you need an item by a specific date, you may contact us and we can tell you when we expect to ship it. The total amount of money is the "merchandise price" plus "delivery fee". You will get a payment request about the amount you have to pay for your order. Please do so within a week. We recommend you to pay for transport insurance and we will automatically add it to your total. Innocent World is not responsible for any damage happening during shipping. International customers may be charged import tax. All additional charges for customs clearing must be paid by the customer. Please contact your customs office for further information. The Japanese Postal Service requests that we list the correct value of the items for customs declarations. We are not able to mark down items for tax reasons. In cases where you receive the wrong merchandise or damaged items make sure to contact us within one week of receiving your package. We do not accept returns or exchanges if the item does not fit or if you do not like the color. We cannot accept returns or exchanges by mistakes in ordering after shipping out, either. so please take due care when ordering. the value of the package or mark it as a gift? Unfortunately, we are not able to comply with these requests for legal and tax reasons, so we ask for your understanding in advance. Innocent World uses several models so we cannot make generalizations about their height.s For a question about a specific model, we ask you to please contact us by email.